Channel modern gypsy style with the Lillianna Long Dress by Johnny Was. 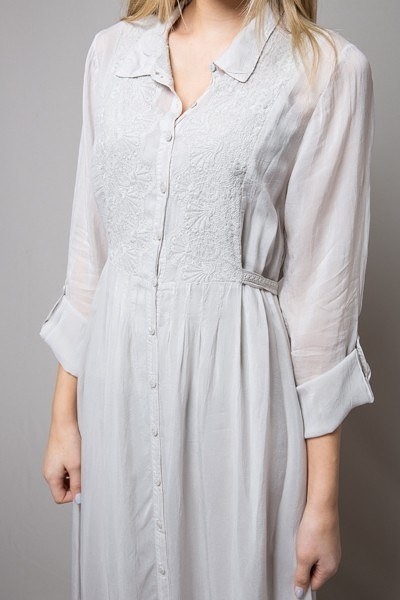 Finely crafted ivory lace is adorned to the front panel and buttons run down the front. Wear as an open cardigan, or wear closed as a dress. The empire waist has an embroidered tie closure for a customized fit. Stroll through a garden in this floor grazing garment. The light airy fabric is dyed in a soft grey hue. The long sleeves flare out and take this dress from day to night. 100% Cupra Rayon. Machine wash with cold water and tumble dry on low.